The last time I went to Iceland, I spent my time on the 8 hour flight from Idaho to Iceland writing this guide book. It had been my intention to make it a product that I sold, but I've decided to make it free! Why free? Because I just released an app called Really Good Photo Spots for the iPhone. The app has many THOUSANDS of the best photography locations in nearly every country in the world, and Iceland is especially well covered. There are more Iceland locations in the Really Good Photo Spots App than there are in this book. In fact, the app made this guide book somewhat obsolete. So, I'm giving it away for free. You're welcome. I hope you enjoy the eBook and that you have an incredible trip to Iceland. The only thing I ask is that, if you're appreciative of this guide book, that you take 2 minutes and download Really Good Photo Spots on your iPhone. It's a free app, but there's a premium version that allows you to save the locations for offline use, which I think you'd want in Iceland. There is so much to photograph in Iceland, and so many locations in this book, that I want to clearly highlight the 8 best spots that will complete your Iceland experience as a photographer. Obviously, the best 8 locations in Iceland is a matter of personal opinion, but if someone were to ask me what my favorite spots in Iceland are, this is the list I’d give them. Most of these locations are widely known, but others are often missed by photographers. While shooting all of these locations in a single trip is ambitious given their varied locations around the country, if you are a go-getter and want to hit all the best spots, here they are. 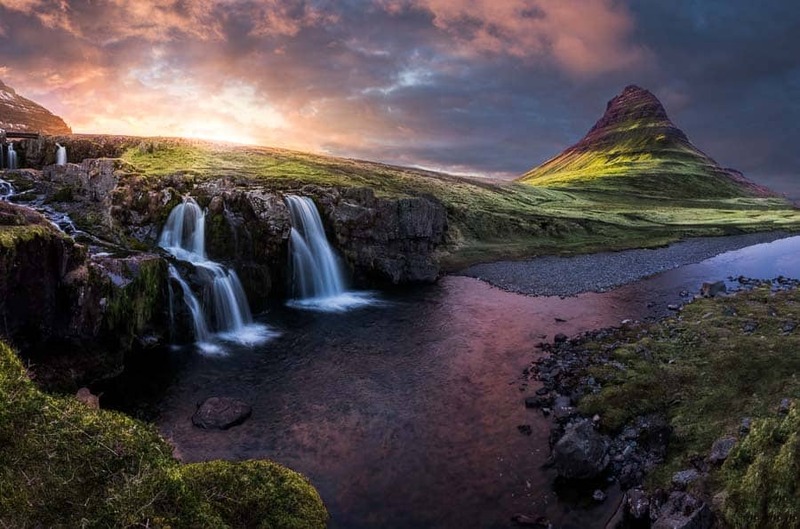 Kirkjufellsfoss is–by far–the most popular destination in Iceland for photographers. With a gorgeous triangle-shaped mountain, a few levels of waterfalls, a river, a lake, and the setting sun all in one shot, it’s a can’t-miss location. Kirkjufell is quite distant from most of the other great locations in Iceland. It is about 2 hours from Reykjavik, so I recommend hitting it on either your first or last day when you’ll be near the airport. The rest of your trip will more than likely be spent in the south and east. The Blue Lagoon is really close to the airport–about a 20 minute drive. It’s a geothermal pool of bright blue water surrounded by lava rock. The blue lagoon is a wonderful place to swim, but can be tough to photograph. If you find the right composition, though, the photos can be absolutely dazzling. Yes, dazzling. The thesaurus told me it was a good idea. Oh, Bruarfoss. This little hidden waterfall is missed by the vast majority of Iceland’s visitors. It’s notoriously difficult to find, but it looks as if God specifically carved this little gem of a waterfall for photographers to enjoy. Visiting the tremendous (again, the thesaurus said it wouldn’t sound dumb in this sentence) ice caves in Iceland will almost assuredly result in some excellent photos; however, it also means that you’ll have to go to Iceland in winter, when the moss on the lava rocks is brown and much of the interesting landscape is blanketed in snow. Still, you can’t NOT visit the ice caves (I’m tired of the thesaurus now, so I’m fighting back with poor grammar). Seljalandsfoss is a massive cave carved into the mountainside that allows you to go behind a waterfall and shoot out. Don’t miss it, and when you visit, be sure to check out nearby Gljufrabuifoss. Skogaffos is a massive waterfall that you’ve likely seen pictured many times. It was the main image used in Apple’s iPhone 6 campaign. Jokulsarlon is a glacial bay in the southern region. The glacier itself is interesting and can make for good photos, but the more interesting spot photographically is the nearby black sand beach where huge chunks from the glacier wash up on shore. 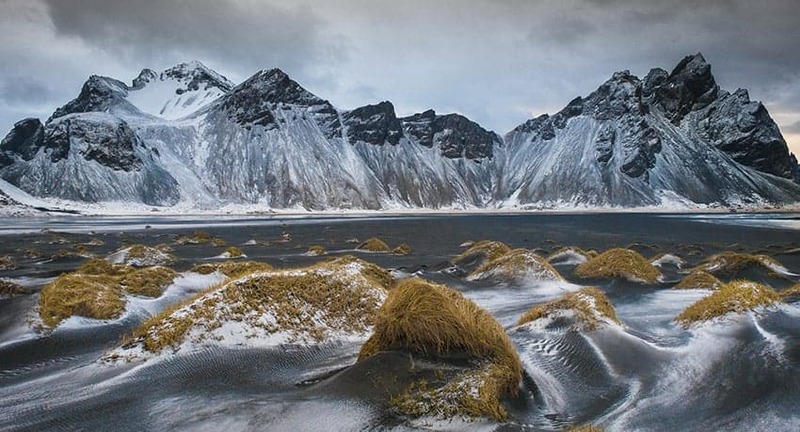 Vestrahorn is a magnificently-shaped mountain on the edge of the beach. Vestrahorn was the impetus for this book. I took a workshop group to Vestrahorn and warned them that I hadn’t tried the location before, and couldn’t find reliable GPS coordinates for the spot. I got us lost for 3 hours before we finally found it, and was teased relentlessly for it. I aim to keep you from making my same mistake. This is Vestrahorn in the southeast portion of Iceland. I spent an entire night shooting this location, and it's one of my favorites in Iceland. The photo locations in this book are broken up into regions. A region is a group of locations close enough to each other that you could hit any one of them during a day in that area. I think the regions system in the book will help you to plan pockets of locations and save time in wondering what to include each day. It’s also helpful to visualize where you are on the map. Currently, there are 10 regions in this book. You’ll notice that this leaves large patches of Iceland unexplored. I plan to fix that some day, but this is all I have in my trip planning document at the present. I think if I were to spend another 3 months in Iceland, it would do nothing but give me more ideas on things I want to see and explore. It’s like giving a dog just one treat. Wait. Did I just compare myself to a dog? The Blue Lagoon is famous because it's not far from the airport and so it's photographed a lot. Most photographers are underwhelmed by the location at first because it's a popular swimming hole and there is a power plant in the background. However, I have made some pretty cool shots at the Blue Lagoon and it shouldn't be ignored. Drive to the large parking lot for the Blue Lagoon and you'll see it's $50/person to enter in the swimming area, but you can walk from the parking lot to the more rustic area to the left at any time–even before the swimming area opens. You can shoot this area for free. This is in here just for your reference so you can find the airport to return home and return your rental car. This is a massive church near the city center with a huge swoop of a steeple. The Sun Voyager is an iconic stainless steel statue located along Saebraut on Reykjavík’s waterfront between Harpa and Hallgrimskirkja. Bruarfoss is a small waterfall and is not visited nearly as often by tourists because it can be hard to find; however, its shape and blue water make for an absolutely stunning photo. Some of my favorite Iceland shots are from Bruarfoss. Don't bother trying to find directions to Bruarfoss online. It's in a summer cabin area and the problem is there are locked gates that change from day to day which are left open and which are locked. So if you get directions online, you'll find yourself blocked; however, it IS okay to go to this location without trespassing. You just can't drive all the way there. My recommendation is to pull into the area and find a spot to park as soon as your route is blocked, and then just walk in. It's an easy 1 mile hike to get to the waterfall. Don't bother asking any of the locals where the waterfall is–we asked SEVERAL and none of them seemed to know of the world-famous little waterfall less than a mile from their house. From Laugarvatnsvegur Road (Highway 37), turn in on Brekkuskógur Road. At the T intersection, go left. Take that road as far up as you can. At the end of the road it's a very short walk to the waterfall. There are several routes of roads through the cabin area where you can try and park if roads are closed, but I know from experience that you can waste hours weaving around in there. It's best to take the route mentioned and just pull off and walk in as soon as you encounter a gate. Many guide books don't even have this waterfall in their books because it's tough to get good directions, so hopefully you find this to be helpful. This is a very famous location where you can walk on a path behind a waterfall and shoot outward from the cave. You'll want an extremely wide angle lens to get the full circle of the cave opening above you and the water coming down. This location is best shot in the evening at sunset, but it's one of those rare locations that actually looks good during the middle of the day to get the water against the blue sky. Almost everyone who goes to Iceland visits Seljalandsfoss, but few know that there's an equally stunning waterfall (photographically speaking) just a few hundred yards away. When you park at the parking lot for Seljalandsfoss, you'll see a trail leading to the left of the waterfall right in front of it. Take that trail to the left for about 1/3 mile and it'll take you straight there. This waterfall is in a cave. You have to get your feet slightly wet to walk through the little slot back into the waterfall. It's tough to get a shot without soaking your lens, but I think you'll agree that this is an incredible location. This is one of the most famous waterfalls in Iceland. You've seen it before on Apple ads, I bet. The waterfall is just off the Ring Road and you can guarantee there will be lots of other people there. I recommend including someone in the photo in the distance to show scale, because this thing is massive and you just can't appreciate the size without someone in the shot. This is an old airplane that crash landed many years ago. It's on a flat black sand beach with nothing else around. You used to be able to drive right to it, but the farmer shut off road access, so now you park along the Ring Road closest to these coordinates and walk about 1/2 mile in to the airplane. This is a black sand beach with sea stacks out in the water. This is a popular location with a large parking lot. I recommend visiting on a stormy day when the tide is not all the way in so you can walk closer down the sea stacks. Would be a cool foreground element in a night photo. This is a terrific spot for a sunrise or a night photography shoot. It's it a tiny little town and you can access it any time. Just don't be too loud at night and disturb the nearby homes. The Ice Beach is just across the Ring Road from the glacier. This is on my list of Iceland's Great 8 for a reason. The chunks of ice that float to here are beaten by ocean waves on a black sand beach. It's an amazing location, and will change each time you go. Sometimes there is a ton of ice, and sometimes less. Each shot at this spot is unique because the ice changes and melts quickly. About 40 minute hike on loose rock to get in to it. It’s cool. Not as impressive as some other waterfalls, but worth a stop if you’re nearby. The GPS coordinates above are to the spot where you shoot from to capture Vestrahorn, but it can be tough to figure out how to get there. The GPS coordinates for the spot where you turn off the road are 64.28253, -15.04251. Basically, it's the last right turn before the tunnel when heading east. You have to pay the land owner a few dollars (I think $8) to shoot there, but you can shoot any time of the day or night. There is a box to put the money in if he isn't there. This is the most popular shot of Iceland–and for good reason. It's a great spot to shoot the northern lights, there's a gorgeous waterfall and a perfect mountain. This location is right next to the road. I love photographing Iceland. I’m quickly turning into an addict. The remarkable thing about Iceland is the lighting. During certain times of the year, the good light lasts longer than anywhere else I’ve seen. On my recent trip, I started shooting golden light at 7:30PM. The golden light lasted an hour, then a sunset that lasted an hour and a half, then remaining color in the sky for another hour. Around 1 AM is when all the color left the sky and it turned to a rich blue hour. 2 hours of blue hour later, the sun was starting to take on the pink of sunrise already. We stayed out all night long shooting in the slowly changing light. Contrast that experience with a typical landscape photography trip. Sunrise and sunset are usually the only times to shoot, and each only has good light for about an hour. The rest of the time we are shooting with 10-stop filters trying to make something out of nothing. The long-lasting light during much of the year is a product of the fact that the sun hugs near the horizon all day long–never reaching more than half way up the sky. I always check sunrise and sunset times with a simple Google search. Type in “When does the sun set on June 7, 2018 (or whenever you’re going) in Reykjavic, Iceland.” Google will tell you the answer right on the results page. That should help you know what to expect on the dates when you plan to go. Be sure to also check the moon phase. If you want to shoot the aurora, you’ll want to go on a night without a full moon. This is Kirkjufell. It's about a 3 hour drive north of Reykjavic. 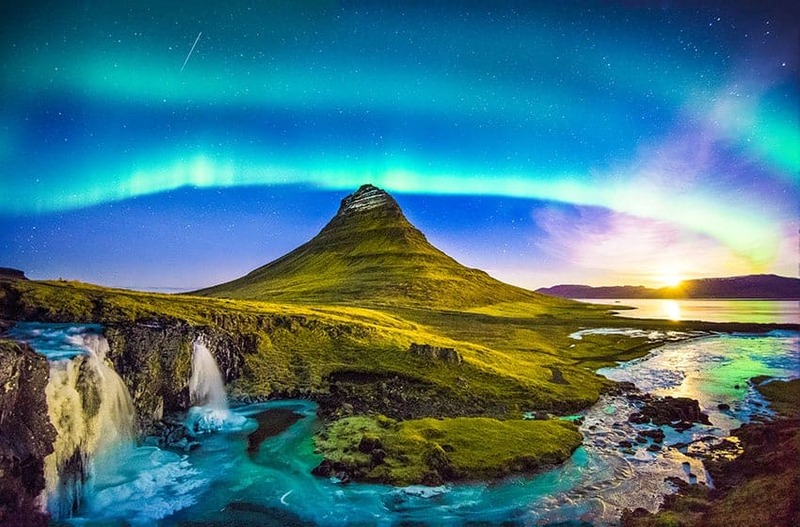 Iceland is about the only place where you can see a shooting star, triangle mountain, waterfall, river, lake, the rising moon, stars, and the northern lights all in one frame. Amazing place. Photo by me–Jim Harmer. But the Icelandic light that attracts more photographers than anything else is the northern lights. Northern lights are not visible during the summer months, nor during much of the spring and fall when the days are long. However, winter months offer a dark enough sky to see the aurora borealis. Seeing the aurora was quite different than I had expected. I’ll share my experience to clarify a few misconceptions that I had before seeing it myself. I photographed the northern lights at Kirkjufell. I had checked the northern lights forecast at aurora-service.org many times during the trip, and this was the night when the forecast was strongest. It happened to land on a rare night when there were no clouds and when the moon would rise just at the tail end of the light show. It seems to me that the forecast for northern lights is never right. It feels more like some meteorologist shakes their kid’s magic eight ball and writes a forecast with a large helping of alcohol. However, it nailed it on this particular night. The lights were perfect. The experience for me, and for many others that I’ve heard from who saw the northern lights for the first time, was surprising. I looked up and saw a long thin-gray line in the sky that at first I thought was a contrail from an airplane, but then after taking a picture, we saw that it was the vibrant green of the northern lights. I had seen so many timelapse videos of the northern lights that I wasn’t sure how quickly they would move. I found that they moved much slower than I had expected. An exposure under 10 seconds would reveal more detail in the lights than a longer exposure, and if I shot for 30 seconds, I saw more of a blob of green than I wanted. Just as the northern lights were looking their brightest, the moon rose over the lake and illuminated thin whisps of clouds with warm light. All in one shot, I captured the northern lights, a shooting star on a blanket of many more stars, Kirkjufellsfoss waterfall which was half-covered with ice, the triangle-shaped Kirkjufell mountain, lava rocks with moss, a river, a lake, and the rising moon. It was so beautiful that it literally brought a tear to my eye. God really put on a show that night. Be SURE to go download the Really Good Photo Spots App on your iPhone. It has all these locations plus many more Iceland locations in the convenient app. The app is free, but you may want to get the $10/year premium account so you can download the locations off-line for when you're in Iceland. When I shoot landscape photography, I spend a significant amount of time researching the weather to try and match the weather to my location. For example, if the clouds look right for a spectacular sunset, I’ll find somewhere that my composition will include a lot of sky in the shot. If the sky is clear, I’ll look for a foreground element that I could use in a Milky Way shot. Recently when I visited for a workshop, I made the mistake again of trying to approach the landscape there the same way as I do in the United States–without much luck. The weather simply changes too quickly in Iceland to be able to find reliable weather information on what the clouds will be like at the time of sunset or sunrise. My lesson learned is that when you’re in Iceland, you just pick a location and go and hope for the best. The forecast is rarely accurate enough to tell you what kind of clouds you have, and at what exact time in a location. Having said that, I will say that your forecasting of the weather will be improved by using en.vedur.is. That is the country’s own weather service that tends to be far more accurate than any of my usual apps. The lesson I’ve learned about Icelandic weather is that it’s incredibly unpredictable, so don’t let a report of unfavorable weather keep you from getting out to the sunset location. You never know. That clear blue sky can fill with spotty clouds in 15 minutes and produce amazing light. Almost every store in Iceland accepts debit and credit card purchases; however, you need a card that has chip-and-pin. Only about half of the locations accept swipe cards, and about two-thirds accept chip cards with no pin. Those numbers are very rough based on the experience I’ve seen workshop attendees have, but it at least points you in the right direction of what to expect. Here’s a quick tip that will save you more money than you paid for this eBook and save you a huge headache. Even though you can generally use a chip-and-pin credit or debit card anywhere in Iceland, it’s certainly unwise to travel without any cash. You need cash in case your (dumb) bank shuts down your card, or a store can’t take a card. So here’s the tip: If you exchange money at the airport, it can cost you as much as $16 to exchange $100. That’s absurd! But many local banks allow you to order foreign currency, and often without a fee. My Wells Fargo business bank account allows me to order Icelandic currency before I leave, pick it up in my local branch. Then, when I return, I bring my Icelandic change and can convert it back with no fee. If you convert $400 into Icelandic currency, you could save as much as $100 on your trip by converting with your local bank before you go. One recommendation I can make unequivocally is to NOT go to Iceland with ANY lens or camera that is not fully weather sealed. Your gear will likely get soaked every single day. Iceland is one of the safest countries in the world. I have never even seen a police officer in Iceland–ever. I think the locals must just be too cold to go outside and commit crimes. As with traveling anywhere, it is always wise to exercise caution, but I personally don’t feel even the slightest bit in danger when wandering through Iceland alone at night. Having said that, don’t come back and sue me when a hatchet-wielding viking troll pops up behind a rock and murders you in cold blood. Always exercise caution when traveling in an unfamiliar country. Also, watch out for hatchet-wielding viking trolls. They are deadly little suckers! However, Iceland does present numerous dangers to travelers and photographers. With the vast majority of its citizens living in one city, the rest of the country is surprisingly remote. It is not uncommon to drive for 2 hours on the ring road without seeing a single gas station or convenience store. Be sure, especially in winter months, to have a blanket, food, and water in the car at all times in case you were to run out of gas. I’d guess that your biggest danger when Iceland is probably falling asleep at the wheel. As photographers, we often stay up extremely late and wake up extremely early to make long drives to photo locations. Matching that with a break-neck pace, the excitement of being in another country, and few convenient spots to stop at a hotel, and you have a recipe for a dangerous driving condition. If you’re traveling in a group, always put two people on the car license so you can switch off drivers, never drive drowsy, and keep someone awake to talk to the driver to keep them up. Also, consider my secret weapon for roadtrips–a bag of popcorn under the driver’s seat so they have some munchies available for a late trip to keep them engaged. Another serious concern for photographers is falling off cliffs. Each year there are photographers who fall off cliffs and die or are seriously injured because they were paying attention to their camera and tripod and forget where they are standing for a moment. Iceland has many precarious cliffs which are tempting photography locations. I usually make it a practice to sit down on the ground when I’m at a cliff-side location so I don’t make a misstep. There are many ways to save money on travel to Iceland. 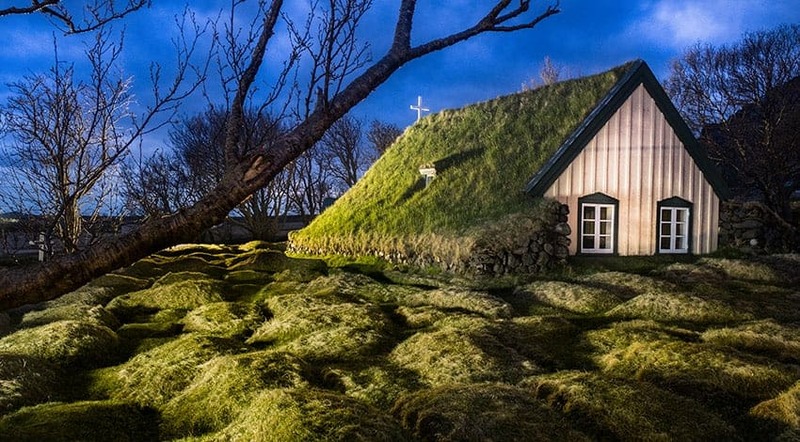 In fact, Iceland is one of the least expensive international photography trips in the world. Airfare to Iceland is amazingly inexpensive. The government of Iceland subsidizes the airline in order to get tourists to go to the country, so fares are low. Unfortunately, they don’t offer those same cheap rates to their own citizens, who have to pay much more to fly out of the country. IcelandAir is unquestionably the airline you’ll take going into and out of the country. They have a complete monopoly on airline travel in the country. The airline itself is not a great experience for many customers. They don’t even give you peanuts on a 7 hour flight. How am I supposed to work up some creative photography artistry without a salty peanut in my gullet? However, there are tv screens on most of their airplanes and they have LED lights above the carry-on luggage carriers that dance like the northern lights as you fly. Nice feature for sure, but I’m still holding out for peanuts. I recommend using JustFly.com for booking your flights to Iceland. I usually use Expedia when traveling elsewhere because I get discounts for booking a flight, rental car, and hotel together. However, in Iceland you’ll more than likely want to stay at several different hotels, which Expedia doesn’t do well. If you just stay in the main city of Reykjavic the whole time, you’ll have to make multi-hour drives every single day to get to some of the best spots. So JustFly.com is probably your cheapest route for booking. Timing your booking is the most important thing you can do to save money on your airfare. I find that booking your flight 7-9 weeks out for domestic flights and 10-12 weeks out for international flights gives me the best rates. Aside from timing when you book your tickets, choosing the time of year you travel will also dramatically change how much tickets cost. Traveling to Iceland in the summer will often cost you more than double what it can cost in the early spring, winter, or late fall, when tourist pressure is low. IcelandAir also offers free “stop overs” for travelers from Europe to the United States or vice-versa. If you’ll be traveling from north America to Europe at some point, consider booking through IcelandAir so you can stop over in Iceland for a week on your way for no charge. Another way to travel inexpensively to Iceland, if you’ll be coming from the United States, is to look at Groupon.com and LivingSocial.com. They offer impossibly cheap travel deals to Iceland regularly. My first time in Iceland, I only paid $599 for my flight and 5 nights in a hotel by using Groupon. The catch with the Groupon and Living Social deals is that the flight is only from a major US airport (usually Boston, New York, or Seattle). You have to get your own airfare to one of those airports. The other issue with doing one of these deals is that your hotel will probably be in Reykjavik for the entire week, which means you’ll be doing a lot of driving if you want to get to all the photography hot spots and back to your hotel each night. Still, it’s worth looking at. If you do decide to use one of the daily deals sites for your Iceland trip, and if you’re traveling in a group, consider using Living Social. They do a deal that if you buy a package deal to Iceland and then share the link they give you with your friends, if 3 of your friends buy the deal through your link, your trip is free! So that means if you’re traveling with a group, every fourth person could be free if you do it this way. That’s quite a steal! Another option for saving money in Iceland is to rent a camper van instead of staying in hotels. Camper vans are a very popular way to visit Iceland because you can stay overnight right at all of the photography locations instead of bouncing back and forth between locations and a hotel. Camper vans are usually a little pricey to rent, but could be a nice way to experience the country. Obviously, your budget for the trip will vary dramatically based on where you are coming from, your preferences for hotels and food, etc. However, I want to share with you the budget that I had for a recent trip to help you get an idea of how inexpensive a trip could be, and what to expect to pay for different things. Gas is expensive in Iceland, and photographers almost always plan to cover too much of the country on their first trip, which means a LOT of driving. On my last trip, I drove over 2,000 miles (3,218 kilometers) in 6 days. I only spent $250 on food for my most recent trip because I bought groceries in Reykjavik and only ate hot dogs from gas stations and granola bars the rest of the week. This was partially to save money, and mostly because restaurants weren’t open by the time we were done shooting for the night. There is one waterfall location that requires as entrance fee, as well as to the location for Vestrahorn. There is a toll on the way to Kirkjufell. You’ll find that prices for airfare, lodging, and your rental car will vary dramatically depending on the time of year you travel. Prices for food and lodging will also vary dramatically depending on how frugal you are. I’m a tightwad, so my budget is probably a little too optimistic for most people. Don't fall in the crack! Icelandic hotels are generally quite clean and sanitary, but the rooms are typically small. Very small. Like, “stand in the middle of the room and touch all four walls” kind of small. So if you’re claustrophobic, you may want to upgrade to a premium room that will allow you to spread out. I’m exaggerating a bit, but do be aware that the rooms are typically smaller. If you will be traveling with a group, it’s worth looking for hotel rooms that offer more than two beds. I have found that many Icelandic hotels have triple rooms or even “family” rooms that have 5 beds in them. That could save you a lot of money if you want to split a room several ways. Hotel Hafnarfjordur near Reykjavik has lots of triple and family-size rooms. The odd thing you’ll find in Iceland is that you smell better before you get in the shower than after. Instead of paying to heat water, Iceland harvests the geothermal heat to warm water in homes and hotels. So if you use hot water when you shower, you will smell distinctly of sulfur. If you don’t like smelling quite so… authentic… I suggest not turning your shower too hot. My favorite hotel in Iceland is the Fosshotel chain. They have a number of hotels near some of the best photo locations. I found their rates to be reasonable, the staff to be courteous, and the rooms to be clean and beautiful. I haven’t stayed at most of them, but the Fosshotel Nupar is excellent and centrally located for a good portion of the hottest locations in southern Iceland. No, this isn’t an ad. Yes, I realize it’s starting to sound like one. 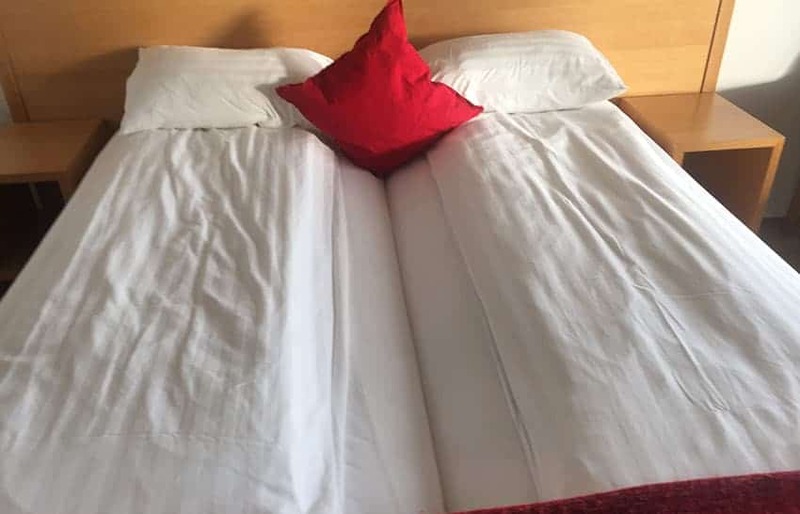 If you’ll be traveling with your spouse, you may want to double check with the hotel that they are giving you either a king or a queen mattress, and not two twin beds pushed up next to each other, which is common in Iceland. Kinda makes snuggling after a long Icelandic photoshoot a little tough. Driving in Iceland will not be an intimidating experience for most travelers. Driving in the city is calm and predictable (nothing like driving in Italy or Costa Rica). They drive on the right side of the road, but have far more traffic circles than stop lights. Transportation is usually the most stressful part of traveling in another country, so you don’t have to worry. Driving will feel very much like you’re in the United States or Canada. One thing to watch out for are the photo-activated traffic cams, which are everywhere in the city. When you’re in the city, don’t go over the speed limit at all. Icelanders don’t go over the speed limit and get annoyed at tourists who do. If you get a GPS in your rental car, it will likely pop up warnings when you’re coming up on a traffic cam so you don’t get a ticket mailed to you. I have only seen a few speed cameras outside Reykjavik, though. Just watch your speed in the city. The maximum speed limit I’ve seen in Iceland is 90kph. That’s surprisingly slow for Americans who are used to driving 80 miles per hour (35mph faster) or Germans who seem to have no concept of a speed limit. It can be tempting to speed off on the Ring Road away from the city, but keep in mind that you’ll be facing many one-lane bridges where you need to watch to make sure no one is approaching as there is no traffic control signal. Once you’re out of the city, there is really only one road going around the country (the ring road), so directions are not overly complicated. However, when you’re heading up to Kirkjufell, be sure to have some cash in your car. There is a toll on the road and they don’t take a card. If you don’t have cash, you’ll be stuck. Heading south and east around the Ring Road, there aren’t tolls. Some of the roads in Iceland are marked with an “F” at the beginning. These roads mostly go through the highland areas in the central area of the country. These roads are not maintained (at least not much) and require adventurous drivers with heavy duty 4×4 vehicles to drive on them. Your rental car company will most definitely warn you not to take any “F roads.” I have not ventured to test them out myself, but I sure have been curious what awesome things there must be in the center area of Iceland…. I have, however, rented a 4×4 and a regular rental car on trips to Iceland. You'll spend more for the 4×4. What I would recommend is to just get a normal rental car on your first trip to Iceland. There are so many iconic locations just along the Ring Road that it's just not necessary to venture off the beaten path. Save the 4×4 for your second or third trip, or else you could waste too much time trying to find locations on dirt roads. The price of gasoline is shocking in Iceland if you are coming from the United States. Even in 2017 when prices were low elsewhere, gas in Iceland still commanded $10 (US) per gallon. That may affect your decision to rent the biggest, meanest, nastiest SUV they have at the rental agency. I almost never get car insurance from the car rental company. My personal car insurance covers me when in a rental car and I trust my insurance company more than some rental car company in a different country. However, I recommend getting the car insurance from the rental company when you visit Iceland. To illustrate, a story. I’ve heard the same version of this story told several times from workshop students in Iceland who had similar experiences with their rentals. I was asked when renting the car if I wanted their insurance and I declined. The young man at the desk then said, “You know, sometimes we find damage to cars if you don’t buy the insurance from us.” He did little to hide the fact that the rental car companies sometimes “find” damage to a rental car if they think they can milk some money out of your insurance company. When I returned the car, the person inspecting the vehicle first asked me “Does your car insurance cover gravel damage?” before he even saw the car. There is good reason why the rental car companies in Iceland are careful to inspect for damage given that there are so many roads with loose gravel, the wind can be so strong that it can blow sand against a vehicle and strip it of paint, etc. One particular caution is to hold your car door with two hands when opening it. I made this mistake at Vik on my first trip. I heard the wind in the car but didn’t realize just how windy it was outside. The EXTREMELY powerful winds were so strong that it nearly ripped the door off its hinges. Recently, an attendee at one of my workshops opened his door at a gas station and the wind ripped it open and door dinged another car pretty severely, causing damage. Another friend who visited Iceland recently made the same mistake and the wind bent the door hinge. Hold your car door with two hands! Almost all rental cars in Iceland have a manual transmission. If you do not know how to drive a manual transmission vehicle, you’re likely to pay 25% more for your rental. If you’re visiting from a country where stick shifts are not common, it may be worth borrowing your hill billy friend’s old truck (I can say “hill billy” because I am one) for a weekend in an empty parking lot, learning to drive a stick shift, before your trip. When renting your car, most rental companies will also offer an internet card that you plug into the cigarette lighter and which instantly turns your car into a wi-fi hotspot for around $15/day. I found this to be worth the cost. I was surprised to find that the data coverage around the country was decent given the remote locations we visited. Your rental car company will most likely try and talk you into purchasing a GPS. Be careful when you’re asked if you want one. Many cars nowadays have a GPS navigation unit built in. Ask them if your car has one before purchasing one. Last time I was in Iceland, I paid $15/day for a GPS unit, yet the car I rented already had one. They said they disable the car’s GPS if you don’t get the separate unit, but I later learned that wasn’t the case. Next time, I’m going to ask. In the unlikely event that you are in a wreck, gas stations have the government form you’ll need to fill out to create an accident report since much of the country is too remote for police officers to patrol. You’ll see that directions in this book are somewhat sparse. Frankly, I don’t expect anyone to follow the turn-by-turn directions. Nearly everything in Iceland is off of one main Ring Road, so a street address is less than helpful. 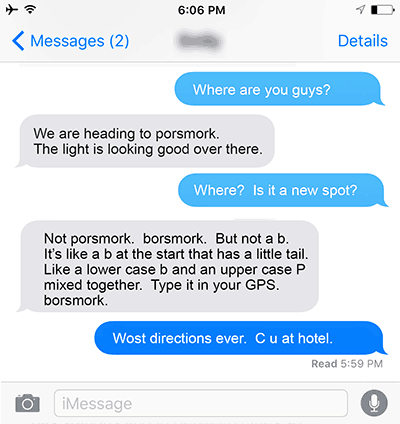 The most helpful directions you can have in Iceland are the GPS coordinates. There are so few roads that your GPS unit in the rental car will get you there without issue. There are a few exceptions to this, which are mentioned in the book as they become relevant. Almost all of the locations in the book are very close to the main road, and I’ve done my best to mention any off-roading necessary to get to a location. One potential sticking point is that the GPS coordinates here could appear to be in a slightly different format than in the brand of GPS unit you have in your car. Suppose you get the coordinates in the industry-standard format that we include in the book: 63.90691, -16.70723. If your car GPS has a format like the one pictured, how do you enter it in? Don’t worry about the north and south, or the negative number in front of the 16. Just type in the digits and it will match perfectly. It’s simply a different way of expressing the same GPS coordinates, and each GPS unit may show it slightly different. When in the city of Reykjavik (pronounced ray-cuh-vik), you’ll find many excellent options for Icelandic cuisine, which is quite good. The city has a large number of higher-end restaurants as well as smaller food-stand-sized restaurants and everything inbetween. So what’s good to eat in Iceland? For breakfast, choose the skyr (thin yogurt), for lunch go with their fantastic pylsurs (hot dogs), and for dinner always choose the lamb. If you spend a week in Iceland, you absolutely must eat a hot dog (pylsa). Icelanders prepare hot dogs much like Brazilians–with crunchy onions, a mustardy ketchup, and other delicious toppings on a dog that is made mostly out of lamb but mixed with a little pork. MMMMmm. If you are like me, you'll eat pylsa for two meals of the day and have their FANTASTIC lamb for the third. Go ahead and eat a pylsa for breakfast–I won't judge. If you are environmentally conscious, or picky about what you eat, be careful what you order. In Iceland, whale, seal, reindeer (yes, even Dasher and Blitzen) and puffin are not-so-uncommon sources of meat in restaurants and sometimes even in grocery stores. Iceland is a developed country and you’re no more likely to acquire food poisoning there than at home. The water is also safe to drink, although I’m not much of a fan of the taste. Upon leaving Reykjavik, you’ll find that restaurant options are almost nonexistent in the rest of the country, and most of the restaurants in smaller towns that do exist, close extremely early. So if you’re out shooting the sunset, plan to have an early dinner before you head out. For this reason, I usually get a nice meal in Reykjavik my last night, but subsist on Icelandic hot dogs from gas station restaurants the rest of the week. Because most of the popular photography locations are far from the city where there are few restaurants, you’d do well to pack a few boxes of granola bars in your bag for the times when you can’t find a restaurant. Everything in Iceland is expensive–especially food. Restaurants in Reykjavik are not overly expensive, and gas station hot dogs are not too expensive, but other restaurants around the country often command a very high price. I think the best way to save on money is to go straight from the airport when you land to a grocery store and stock up on as much food as you can. Then eat that during the week instead of eating out. You would think this is an obvious thing to include on a packing list, but a friend of mine who hadn’t traveled much was going on a trip with me and didn’t realize he needed a passport. Yes, seriously. He had read online that Americans don’t need a visa to visit Iceland, and he confused that with thinking that he wouldn’t need a passport either. That’s a bad realization when you’re at the airport ready to take a trip of a lifetime. You probably won’t need to bring much Icelandic currency. Almost everywhere will accept a card as long as you have BOTH a chip in your card AND a pin code for your card. It’s worth having a little in case your bank shuts down your card, noting international activity and deems it suspicious. It rains constantly in Iceland, and it can be extremely windy. It matters little how warm your inner layers are if the wind penetrates them, or if they get wet. It’s worth spending a bit more money on a good rain coat with taped seams. Check out this video on my Youtube Channel where I show the clothing setup I use for landscape photography. The video will open in another tab for you. I personally don’t use water-proof pants. They get SO hot SO fast and make you feel so muggy that unless there’s a hurricane, I don’t like them. Instead, I wear water-resistant, quick-drying tactical pants from a company like 5.11. They have tons of pockets which is nice for carrying gear, a passport, etc. They also have very thin little kneepads built in so I can comfortably kneel down for creative angles, and they have rip-stop material which is great so they don’t get ripped on the lava rock in Iceland. Waterproof boots are a must for landscape photography. They will enable you to shoot in really muddy locations, walk through a small a mount of water, etc. Wearing gators over your boots will really help at a few locations in Iceland. There’s a great little waterfall near Seljalandsfoss that you have to wade through a light bit of water to get to, and on the ice beach at Jokulsarlon and at other beaches you’ll want gators to keep your feet dry while getting splashed by the waves. The disadvantage of gators is that if you get in too deep, water can come over the top and drench your boots. Another option (probably a better one) is to purchase NRS Boundary Neoprene socks. The advantage of these is they keep your feet dry and warm, and they are small to pack in a bag. The disadvantage is that they go under your boot, so you’ll have to bring along some shoes that can get wet. Also, they have a tendency to allow little holes in the seams over time. Whatever bag you choose, be sure it has good waterproof material, is lightweight, and has a waist belt to take the weight off your shoulders. Okay, I’ll admit it. I have carried a camera rain cover with me to every landscape shoot for the last 5 years and I have never once put it on my camera. Since I shoot weather-sealed bodies, I usually don’t worry about it. However, I recently learned the hard way that you have to make sure the lens is weather sealed as well. 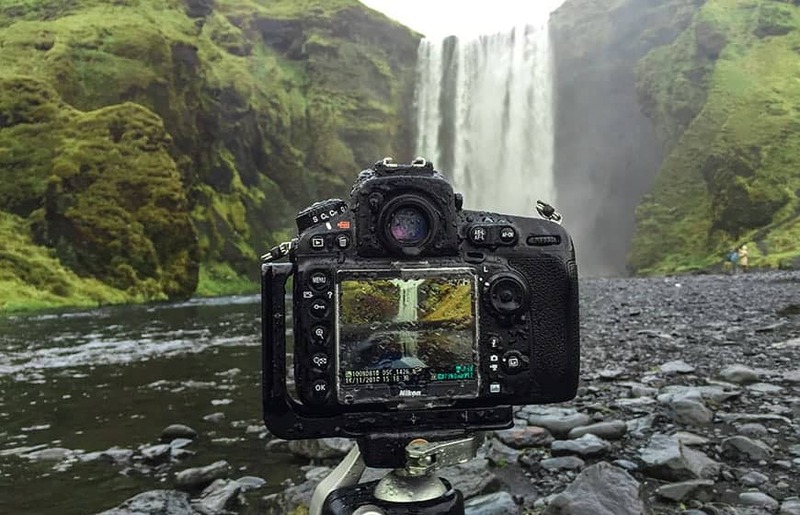 I was shooting an un-sealed lens and it failed on me when it got a little spray on it from an Icelandic waterfall. I spent 20 minutes in the hotel blow drying it with a hair dryer to get it working again. 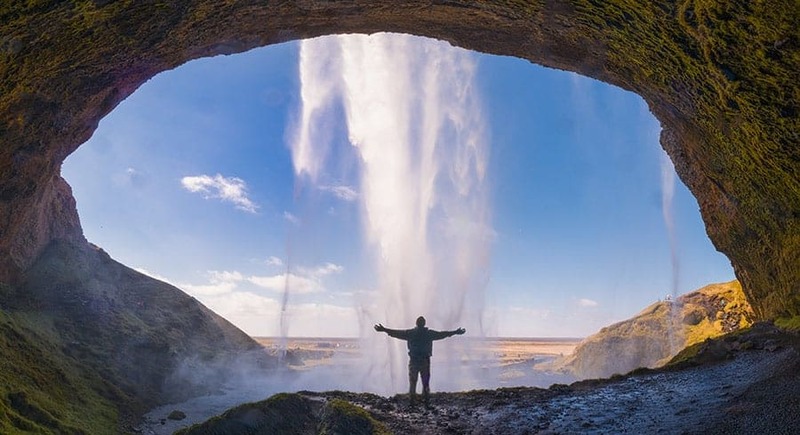 You can’t have too wide of a lens for Iceland–especially for locations like Seljalandsfoss where you are in a little cave behind an enormous waterfall. The Canon 11-24mm lens is dynamite for this location. Especially if you shoot a mirrorless camera, which eats camera batteries faster than a DSLR, bring more batteries than you expect to need. I usually travel with 9 batteries. I personally prefer shooting cards that are 64gigs or larger. I back up the photos to my laptop regularly while I travel, but I like never needing to worry about filling a card during a shoot. My personal preference is a 13” Macbook Air because it’s so incredibly lightweight and plenty fast for photo editing. If you’re buying a laptop for travel photography, be sure not to get too large of a screen. If you get a large laptop screen, you won’t be able to open the lid all the way when you’re on the airplane. I used to have a 15” screen on my travel laptop and much prefer this smaller one so I can post-process on the 7 hour flight from Iceland back home. If you are in the Apple ecosystem, Apple sells an international travel kit for its Mac and iPhone cords. You just pop the international adapter for the particular country on your normal charger and you’re ready to go. It also works for your iPhone charger, and it’s much smaller and lighter than a typical power adapter. Some people buy a SIM for Iceland while they are there. I haven’t done that before, but I get the wifi card that the rental car companies sell and then I keep my phone on airplane mode during the trip. I can still text and access the internet by connecting to the wifi card. If you are traveling in a group and have more than one car, then walkie talkies will be your best friend since most people won’t have cell service. Otherwise your cars can get separated in Reykjavik traffic and you’ll never find each other again. Frequent travelers recommend talking with your doctor to get extra of your prescription so you have twice as many pills as for the number of days you’ll be staying, and to bring your pills with you in your carry-on. Iceland uses the two-prong circle outlets that are common in Europe. I personally use a Feisol CT3442 tripod because it’s strong and impossibly lightweight, fitted with a Really Right Stuff BH40 ballhead. I recorded a video for my Youtube Channel showing 6 good pro options for tripods in Iceland (link will open in another tab, and be sure to subscribe while you're there!). My personal preference is a Fuji X Pro-2 at the moment of writing, but I also have a Nikon and a Canon that I use for testing lenses to write about on Improve Photography. You’ll have lots of devices and batteries to charge while driving, so it’s nice to have a power inverter. I personally prefer an LED, daylight balanced headlamp, so it can double as a light painting flashlight. I always bring an inexpensive external battery for my cell phone so I can charge my phone at the airport instead of fighting for a seat with a plug. I used to scoff when I walked by the passengers in first class and noticed that all of them had wasted $250 on Bose headphones. Then I tried some on a flight and was immediately sold. They analyze the noise around you and cancel it out with competing sound waves. I was amazed at how much more fresh I felt after traveling with these headphones since the constant noise of the plane and airport wasn’t bothering me. Worth the cost. I usually bring a polarizer and an 3 stop neutral density filter with me usually. Sometimes I’ll bring a 10 stop neutral density filter if I think I may want to do a mid-day Hail Mary shot when the light is too bright to pull anything else off. If you bring a full water bottle, airport security will take it from you. If you forget a bottle, you’ll pay $7 for a dumb bottle of water in the airport. If you don’t drink frequently while traveling, it’s easy to dehydrate and get tired because the air is so dry on planes. This is the one I always forget. When you’re flying international, you have to fill out the declaration forms and I always forget a pen in my bag so I have to bum one from someone on the plane. It will be a pain to try and access this book on a device while traveling. Press print before you leave so you have everything available to you on the go. I don’t remember the last time I did a workshop where at least one attendee’s luggage wasn’t lost. To reduce the risk of lost baggage, I recommend printing your name, the hotel you’re staying at the first night, and the address of the hotel on a large piece of paper and putting it in your suitcase on top of the clothes so airport personnel can easily find you. I always try to learn a little of the language before I travel to a country, but in Iceland it’s not totally necessary. Although the natives speak Icelandic to each other, nearly everyone you encounter will speak perfect English as well. Icelandic was only named the national language in 2011 despite it being the undisputed language of local communication. You can expect that everyone will speak English except for the elderly people who may not have learned it in school when they were young. Having said that, a few tips on how to at least pronounce a few things to help you communicate with the locals. If a letter does not have an accent above it, it’s always the short form of the vowel. It’s not like English where we put vowels together to create the long forms. The Icelandic alphabet has 32 letters. That doesn’t seem like much of a problem until you’re trying to text another car in your group to go to a location with a letter that isn’t in your cell phone’s keyboard. Then you can’t communicate with them what the name of the location is so that they can type it into their GPS. The image on this page is an example of what that looks like. Pronunciations are not phonetic like in Spanish or Portuguese where each letter is always pronounced in a predictable way. For example, the letter “f” is pronounced like an English “f” if it’s at the start of the word. If it’s in the middle of a word, it’s pronounced “v.” If it’s before an “l” or an “n”, it’s pronounced “b.” Basically, what you need to know is that you’ll never say anything right during your trip. Accept defeat and look like a dumb tourist. Wear a fanny pack and a Hawaiian shirt to complete your “dumb tourist” ensemble. If that doesn’t suit you, then just fake a cough while pronouncing anything in Icelandic to muffle your ignorance. My first time I went to Iceland, I came back having had the experience of a lifetime. I loved it. I took one really killer, 5-star photo of the northern lights over Kirkjufell. However, I realized that my excitement of seeing many of the other locations had overcome my curiosity for finding creative angles. My photos felt more like snapshots of amazing places. The locations were amazing, but the photos were somewhat predictable and lacked artistry. I don’t want you to have that happen to you on your trip, so I came up with a series of photo challenges that I sometimes give my workshop students to force them to stop and think about the photography techniques they are using, and not just sit there stunned at the size of the waterfalls and the smell of sulfur. If you read through this list right before your trip, my hope is that it’ll trigger in your brain and help you to think of new ways to capture the locations as you’re in the field. Include a person as your foreground element in a photo. This technique will help to remind you to include something to give the photo a sense of scale. The waterfalls and mountains in Iceland are massive, but they won’t feel that way in a photo without that sense of scale. Shoot a panorama. It can be easy to make your composition be only as wide as your widest lens, and Icelandic landscapes are beautiful all around the horizon, which makes it especially conducive to a panoramic composition. Use a 10-stop neutral density filter during the day for an extremely long exposure. The long-lasting summer sun can turn you into a “light snob”–turning up your nose at any daytime shot. Try a 10 stop neutral density and see what you can do with an extremely long exposure. Take pictures of just the sky in one location, and Photoshop it onto another photo that needs a sky replacement. Take a photo with your tripod set as low as it can go. It can be easy when you’re tired to just shoot at standing height. The black volcanic rock can be a great foreground element, but it won’t stand out in the photo if the tripod is too high. Shoot a short video clip that you can use to create a cinemagraph. You’re best to shoot a scene where only one thing is SLIGHTLY moving. Use flash on an intimate landscape. A perfect use-case would be when shooting a tight shot of the door to a turf house. Take an epic shot of yourself (it’s more classy than a selfie if you say it that way) taking a picture with your camera and tripod set in an epic spot. Every self-respecting photographer needs a killer profile picture for Facebook. I hope you enjoy your trip to Iceland. In my opinion, it's the best landscape photography location on the planet. I hope you'll check out Really Good Photo Spots and give it a try while you're on your trip!